Capture the sunrise and sunset on this magical lake property. Feel the rhythm of the water as you overlook the luxurious saltwater pool/spa onto Lake Windward. $1M+ renovation in 2014 including a 3rd car garage, mud room, and boys&apos; wing. The chef&apos;s double island kitchen commands professional grade wolf and subzero appliances, adjoining an outdoor veranda with grilling station. Enduring architectural details and stunning lake views flow throughout the home. Enjoy the backyard oasis with flagstone patios and private dock. Only the finest for those who demand excellence. Prestigious Northshore at Golf Club of GA. Gated, guarded 24-7. European stone, hard coat stucco on golf course & Lake Windward. Salt water vanishing edge pool w waterfall spa, covered terrace patio w stone fireplace, lodge themed terrace level w wine cellar & bar. Master on main plus 5 ensuite bedrooms, custom closets. 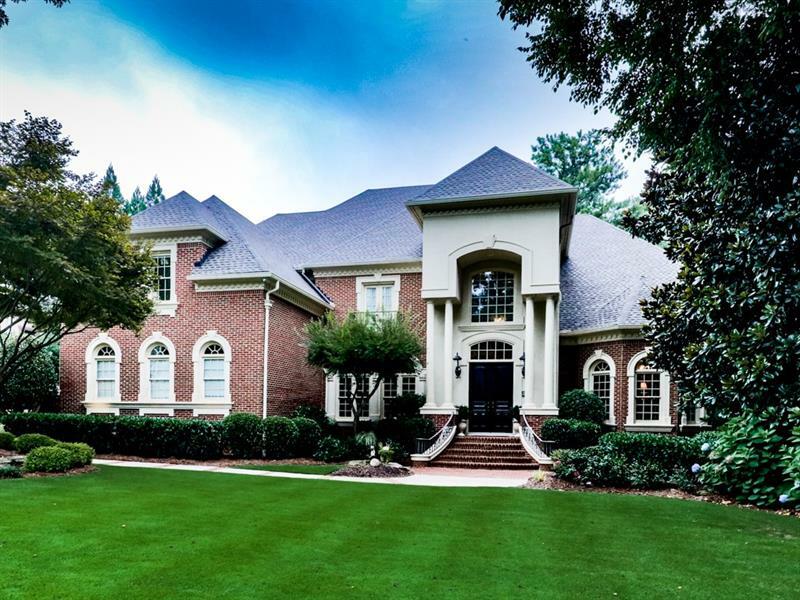 Exquisite kitchen w Wolf, Subzero & Dacor appliances, 10&apos; walnut island, fireside keeping rm, cathedral ceiling bfst rm. New roof, exterior paint, upgrades galore, meticulously maintained. Home hosted parties of 100 guests. An entertainer&apos;s destination! MILLION $ VIEW! 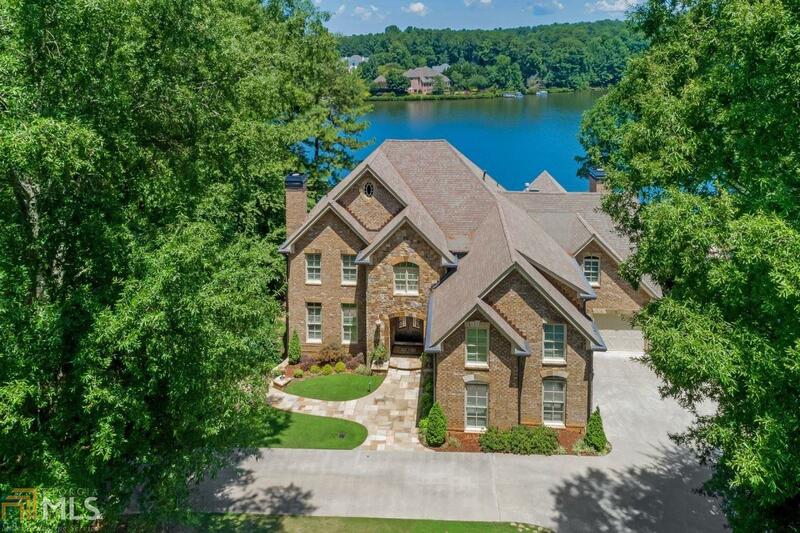 SPECTACULAR HOME ON LAKE WINDWARD*PRIVATE DOCK* UPDATED GOURMET QUARTZ KITCHEN W/SS APPLIANCES OPENS TO SPACIOUS EATING AREA & SUNRM OVERLOOKS PANORAMIC VIEWS OF LAKE & VAULTED FAM RM & QUARTZ BAR W/BEV FRIDGE. 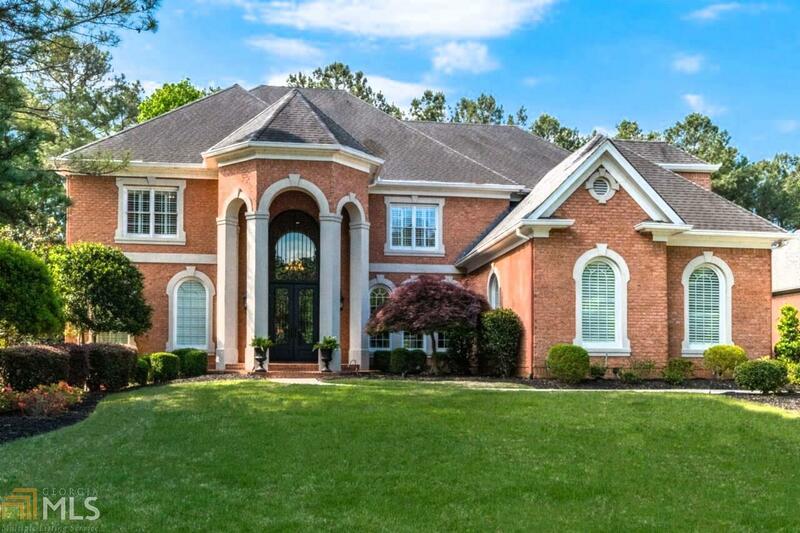 HARDWDS THRU MAIN*VAULTED FORMAL LIV RM W/BUILTINS*BANQUET DIN RM*LUXURIOUS MASTER ON MAIN W/INCREDIBLE VIEWS!EN SUITE ON MAIN + 2 SECOND MASTERS ON 2nd LEVEL W/ WALK IN CLOSETS & LG FULL BATHS! SPECTACULAR VIEWS ON TERR LVL W/STONE FIREPLACE READY! *LARGE DBL DECK OVERLOOKING THE LAKE*NEW DRIVEWAY*MAINTAINED TO PERFECTION*OS GARAGE W/STORAGE RM. 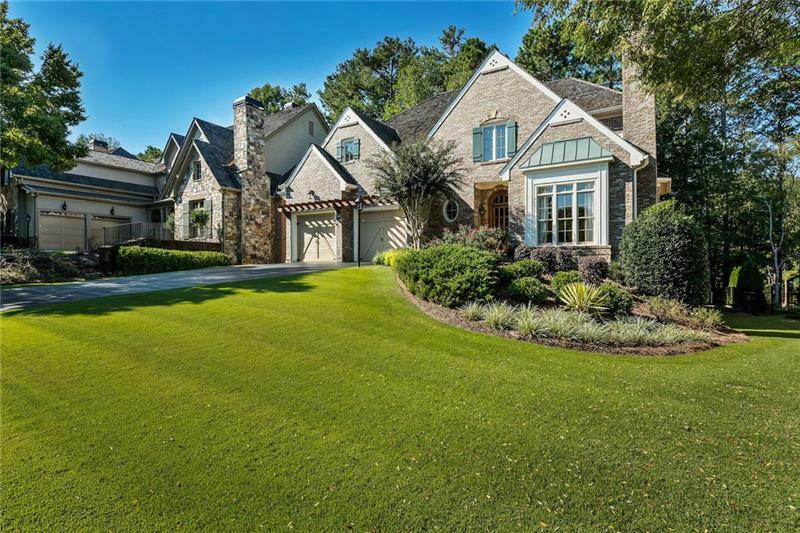 STUNNING estate in gated Northshore, the exclusive community with its own pool, tennis courts & clubhouse!This exceptional home is meticulously kept! 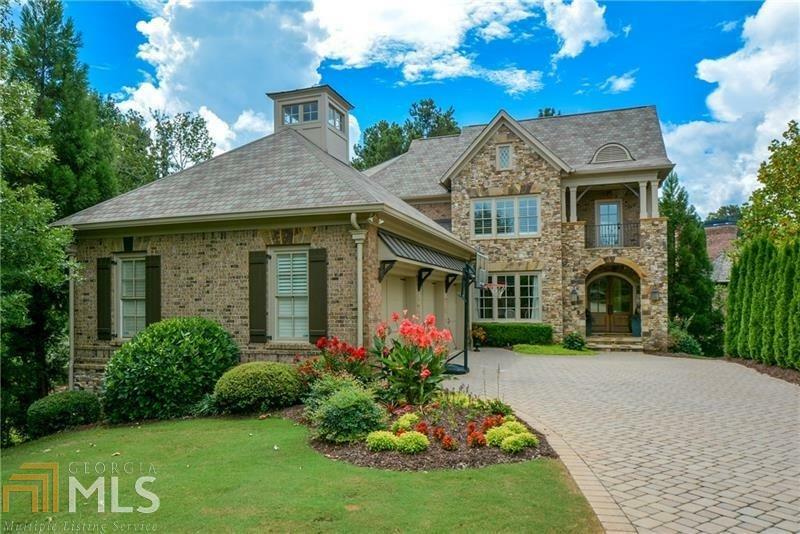 COVERED veranda overlooks pristine private lot on 14th fairway of Golf Club of Georgia-SEASONAL LAKE VIEWS!Chef&apos;s kitchen opens to grand keeping room with 1 of 4 FP&apos;s. OPULENT MASTER SUITE on main w/exquisite bath. High ceilings & large bedrooms w/private baths. AMAZING terrace level has 2nd MASTER IN-LAW suite, bath w/steam shower, full kitchen, EXECUTIVE office, sunroom & more. PERFECT for your FAMILY & ENTERTAINING! 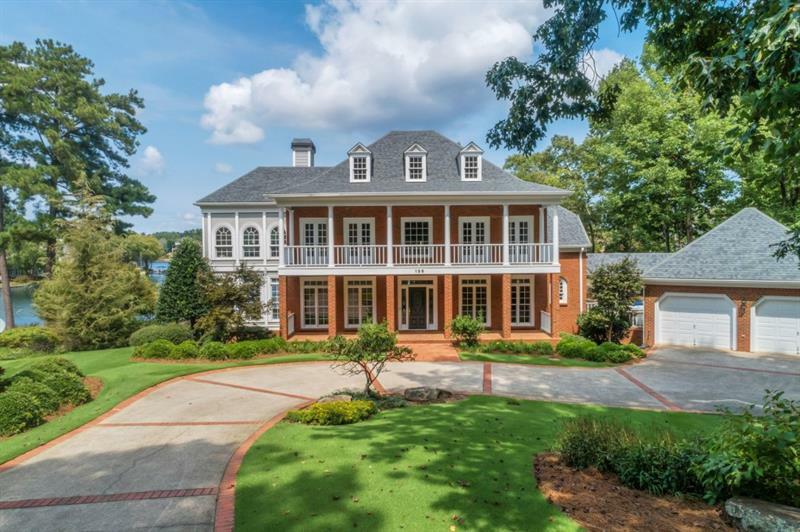 This timeless southern brick beauty features a double covered front porch with french doors throughout the home and is called the first dream home on Lake Windward. The floor to ceiling windows and doors stream sunlight into the home and offer picturesque 180 degree lake views. Newly updated kitchen has white cabinetry, black leathered granite, new appliances and adjoins a bright sun room. Nicely updated baths, new flooring and interior paint throughout the home. 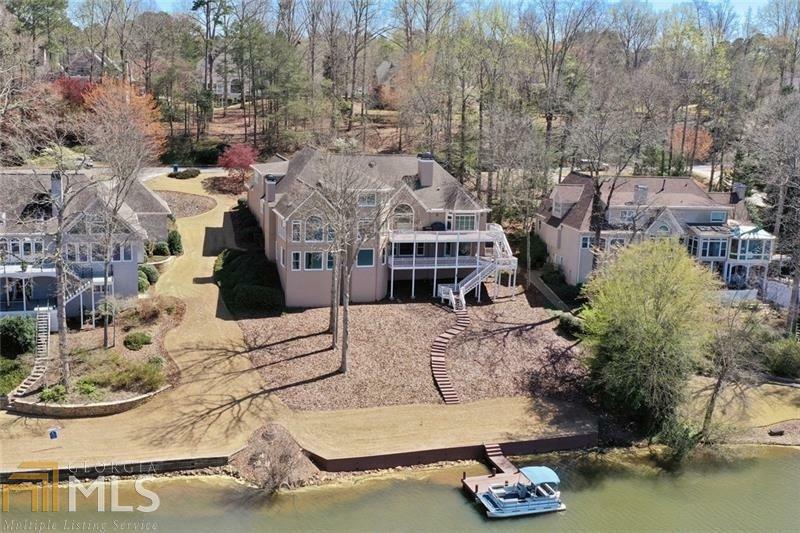 Amazing landscaped grounds feature a deck, stone seawall, private dock and 279&apos; of pristine lake frontage! 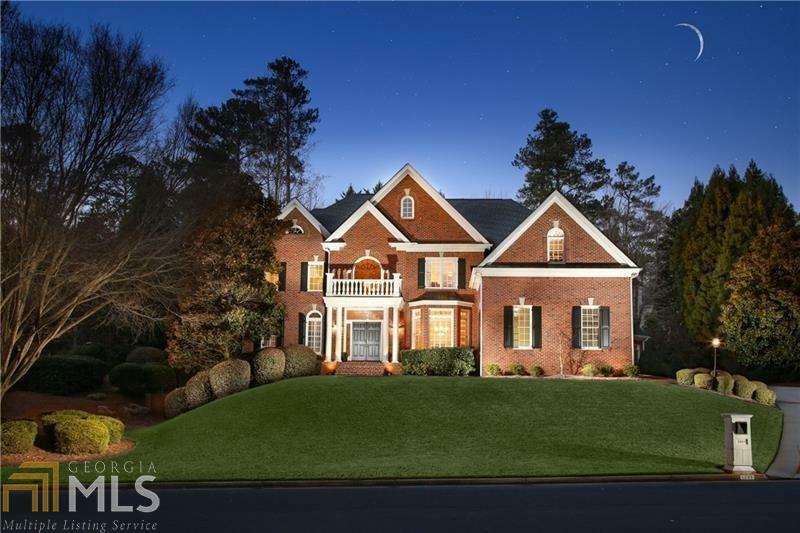 This timeless southern brick beauty features a double covered front porch with french doors throughout the home and is called the first dream home on Lake Windward. The floor to ceiling windows and doors stream sunlight onto the new hardwood flooring throughout the main and offer 180 degree picturesque lake views. Newly updated kitchen has white cabinetry, black leathered granite, new appliances and adjoins a bright sun room. Nicely updated baths, new flooring and interior paint throughout. Amazing landscaped grounds feature a stone seawall, private dock and 279&apos; of pristine lake frontage! Walk to Windward&apos;s award winning amenities including 22 tennis courts, 4 pools, sports park & 195 acre lake. Minutes from GA400, Big Creek Greenway, Avalon & City Center. Custom craftsman brick home w/master on main, 5 bedrooms, 5 1/2 bathrooms & 20 ft. ceilings. DR & LR have Travertine tiles & coffer ceilings. Kitchen features "All" Viking appliances, floor to ceiling cabinets, leathered granite island & farm house sink. Keeping Rm w/beautiful stone FP w/french doors onto Veranda w/breathtaking view of Golf Course of GA. Retreat to Master suite & spa like bath. 3 Bdrms upstairs all on-suite. Entertainers delight on terrace level w/painted floors, game room, open media, full bar & fabulous guest suite. Easy walk to GCOG. Understated Elegance is an understatement! Northshore home is both impressive & welcoming. A comfortable yet elegant chefs kitchen with a unique U-shaped Family Bar overlooking the coffered keeping room encourages family life at it&apos;s best. Master retreat with gorgeous palladian overlooking the GC and lake. Master bath to melt away in and enough closet space to get lost in. True executive office stimulates excellence. 4 oversized bedrooms with private baths; one on the main for guests. Landscaping is breathtaking. Perfect for family memories or executive entertainment. Old World Grandeur And Timeless Grace. 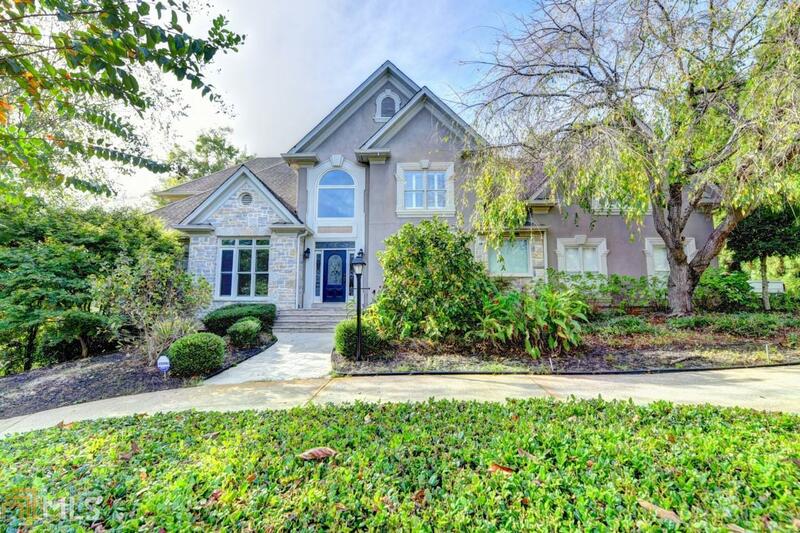 Executive Elegance throughout this Traditional European style home located on Golf Course w/lake views on flat beautiful lot. 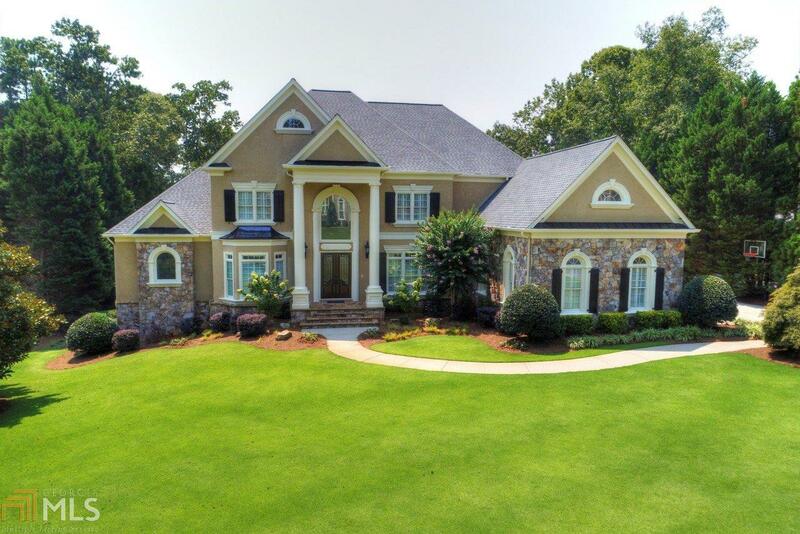 Step out of your master retreat with palladian windows overlooking the Golf course/lake. 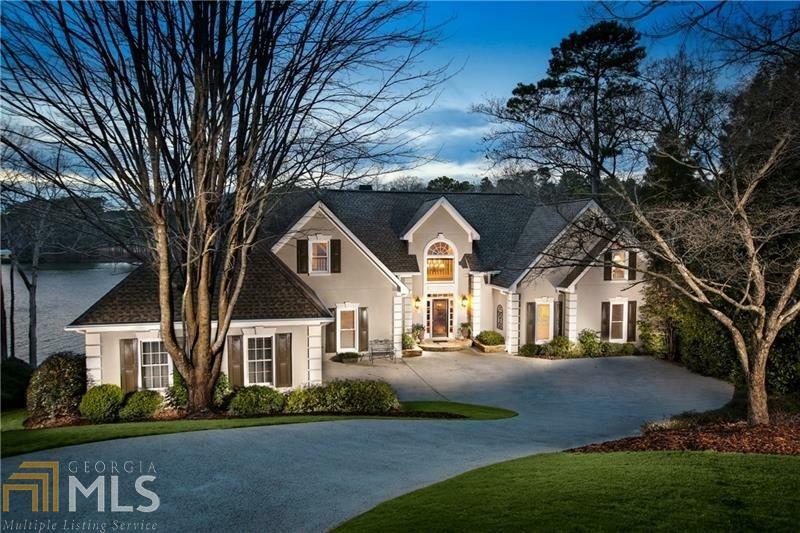 The amazing chef&apos;s kitchen boasts NEW JENNAIR SS appliances, large center island, new granite - just breathtaking - adjoins oversized keeping room w/vaulted ceilings. 2 story great room w/wall of windows. Hardwood floors, 4 fireplaces, terrace level w/media rm, mahogany bar, rec rm, guest suite & screened porch. 3 large bedrooms on upper level. Amazing Home! Elegance at its finest in this exquisitely appointed home in gated Bay Pointe of Windward.Spacious main level includes en-suite,study,din rm for 12+,dramatic light-filled 2-story liv rm.Chef&apos;s kit overlooking inviting keeping rm w/spectacular trusses & pass through sunrm.3 2ndry bedrms,fireside master suite w/lavish bathrm,cedar closet,his & her Cailf. closets.Terrace offers a state-of-the-art theater w/terraced seating & circular trey ceiling,exercise rm/rec rm,billiard rm w/kitchenette/bar,ample storage. Expertly landscaped, a master gardener&apos;s paradise. This European hard coat stucco estate, located in the gated enclave of Bay Pointe, features a grand foyer, gourmet kitchen with granite and stainless steel appliances, keeping room, guest suite on the main, and study. The fireside master retreat leads to a luxurious bath complete with a soaking tub. The secondary bedrooms are spacious with large walk-in closets and en suite baths. The daylight terrace level is an entertainers dream with a fireside den, wine cellar, and home theater. The outdoor oasis is complete with an expansive deck, fire pit, waterfalls, and spa. Custom build home in one of Windwards most sought out, gated, golf club communities, Ardsley Park. Exquisite design throughout the home. Open floor plan with hardwoods throughout the main level. Gorgeous chef&apos;s gourmet kitchen overlooking the 17th fairway. Master Suite with sitting room, custom built in closet and fireplace. HIGH END Finished trim and exquisite solid wood interior doors throughout terrace level with upgraded media room, bar, fireplace and wine cellar. Too many amenities to list. A MUST SEE!!!! EXQUISITE WINDWARD ESTATE HOME! Architectural details, mouldings & superior craftmanship make this a comfortable family home as well as a showplace for entertainment! 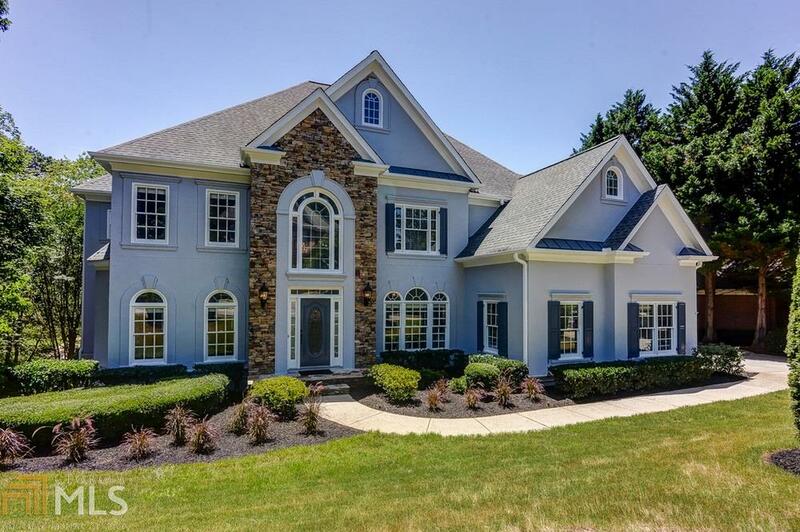 Luxurious Main Lvl Master retreat.Two story granite/limestone foyer, stunning library/bookcases, beautiful formal DR, breathtaking grandroom w/palladium windows, gourmet kitchen w/keeping room. Four fireplaces. Gracious winding staircase leads to upper lvl bedroom suites & huge loft area.Casually perfect terrace lvl w/5th br/ba. Professionally decorated & impeccably maintained. Renowned Windward amenities.